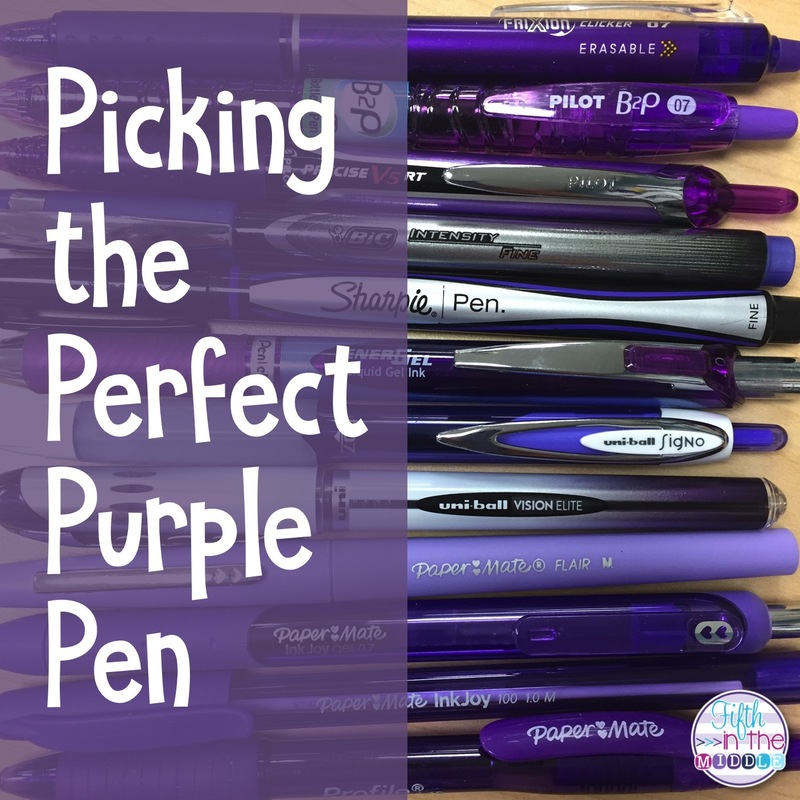 I am guessing that a decent number of you are like me in that you are on the constant search for the best writing instrument for all of the teachery things that you need to do. And for your planner. And for your doodling. And if they come in purple, that's even better! 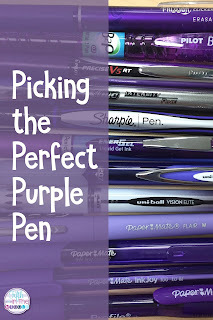 I decided to test drive write a dozen different types of pens to find the one(s) that I absolutely cannot live without. My "official scientific" results may (or may not) surprise you! Although these come in different colors, I used purple exclusively. Because honestly, I really don't care about the other colors. NOTE: This post contains affiliate links. I get a few cents if you purchase, but using these links doesn't add to what you would pay. Thoughts: My students thought that I was committing some sort of sorcery when I was writing a math problem and erased a mistake. It is not 100% erasable, but it's close enough to be a really awesome thing. Doesn't always have the smoothest ink flow with the ball point, especially when you start writing. Thoughts: I like how this is made from recycled water bottles. Purple ink is more of a violet. The textured barrel gives you somewhat of a grip, but I found my hand still slipping a bit after a lot of use. I will probably gift these to our social worker since they're her favorite. Thoughts: This particular pen might be a little too fine for my everyday writing. Ink flow seems to be decent. I like it for doodle notes and other detailed doodling. Thoughts: I love how this pen writes. However, the barrel is too slick in my opinion. Thoughts: This used to be my favorite pen, but I don't find myself reaching for it as much anymore. They are thin and don't have a grip. They aren't as comfortable for writing over a longer period of time. But I really do love the smooth writing and color. Thoughts: Purple color is more violet. Nice grip. Also fun for doodling. Another one I reach for regularly. Thoughts: Nice grip. Ink flow isn't as smooth with the ballpoint. Not in my regular rotation at the moment. Thoughts: Very deep purple... almost hard to tell that it is purple. Lots of ink comes out to make a wider line. It takes a while to dry. Overall, not a fan. Thoughts: You can't go wrong with a Flair. Thoughts: Smooth writing (although sometimes a little globby), pretty deep purple color. It makes me want to doodle and add swirls to my writing. I find myself reaching for it the majority of the time... even over my Flairs! Thoughts: Triangular barrel with no grip makes it a little tricky to keep from sliding around in my hand. Another ball point that is just okay. 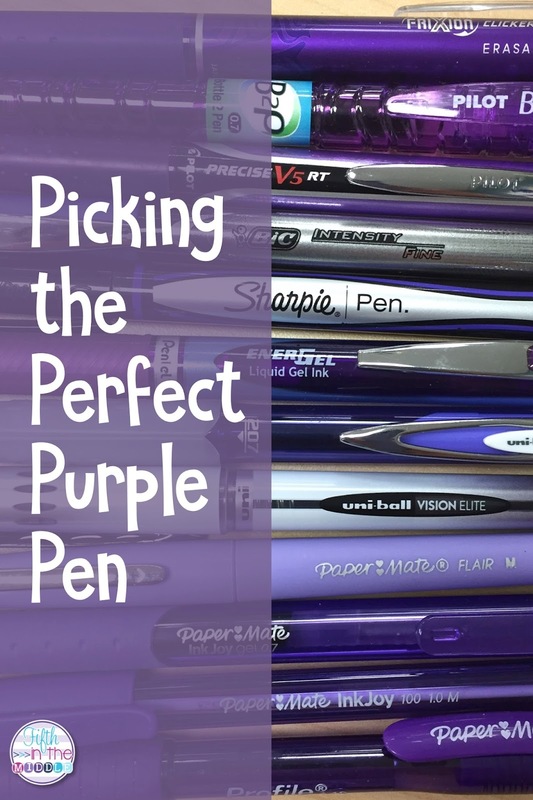 Thoughts: Violet color and standard ink ballpoint, which means that the ink flow isn't as smooth. I put these out for my students to "borrow". How did I do? Did I try your favorite? Let me know in the comments! I absolutely love the InkJoy Gel pens. They are my favorite!! I have them in my backpack, my Bible study bag, on my desk at school, on my desk at home. I, obviously, have a problem. That's a very strong reaction, but I respect your opinion and I know what you mean ;) I like my flairs for some things (mostly when I want to use other colors than purple), but not for everything. The InkJoy Gels are a definite winner! Well, I couldn't narrow it down to one, but I liked the InkJoy Gel, FriXion, and the EnerGel the best. I'm a self-proclaimed pen snob. 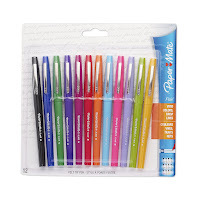 : ) You need to check out Papermate Liquid Flair medium point. Absolutely hands down my favorite pens to grade with! Best of both worlds between flair pens and the InkJoy Gel. I'm in! Off to Amazon!